Melville, NY USA – As part of an ongoing commitment to ensure the safety of water supply operations in all member districts, The Nassau Suffolk Water Commissioners’ Association (NSWCA) attended the recent Hurricane Seminar held at the Morrelly Homeland Security Center Bethpage NY. Deputy Commissioner Leonard B. Symons of the Town of Oyster Bay presided. The seminar focused on effective planning for potentially catastrophic events like Superstorm Sandy and Hurricane Irene. Of particular interest to the NSWCA were discussions regarding the improvement of forecasting and outreach, including partnerships with national, state and local emergency operation centers. The seminar included representatives from the National Hurricane Center, NOAA (National Oceanic and Atmospheric Administration), Nassau County, PSEG, and the Town of Oyster Bay. The NSWCA was represented at the event by Commissioners Niznik and Michael F. Rich III, (Oyster Bay Water District), and NSWCA Secretary Andrew Bader (Commissioner, Plainview Water District). 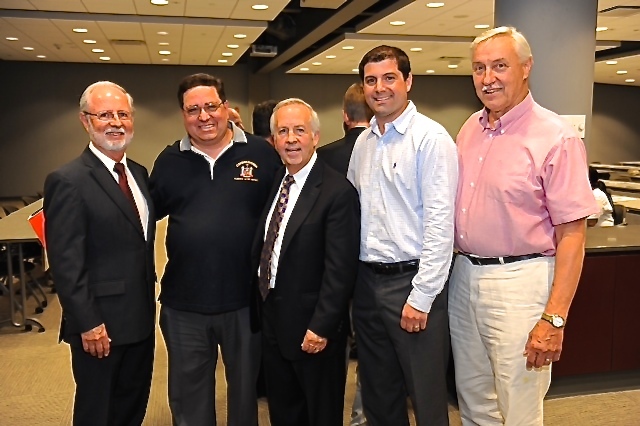 Left to right: Channel12’s Bill Korbel, Plainview Water District Commissioner Andrew Bader, TOB Deputy Supervisor Leonard B. Symons, Oyster Bay Water District Commissioners Michael F. Rich III and Richard P. Niznik.